For many centuries natural cure and healing from plant and animal has been used by people from all over the world. In the 1800s, when these natural sources are deemed as too inconvenient and laborious to be processed for use or don't produce enough of the medicine required, new synthetic drugs such as the famous pain killers are created to duplicate nature and produced in laboratories to fill up the gaps in supply or even to some extent replace the old medicinal knowledge, techniques, and traditions. Today there seems to be an ever increasing interest in using natural alternative medicine. The renaissance of using natural ingredients such as wheatgrass, herbs, fruits and vegetables, in pursuing better health and natural cure for ailments appears be stronger than ever. With new waves of literature touting the benefits of natural foods and home remedies, many modern societies are trending in the direction of natural health and more sustainable way of living. So why is there an expanding number of people forsaking pharmaceuticals and turning to natural cure for diseases and health conditions like arthritis, bad breath, stress, and sleeplessness? While there is little doubt that synthetic drugs in orthodox medicine excel in providing quick relief of symptoms in cases of critical emergency, they are much less effective when it comes to prevention, chronic disease, and in addressing the mental, emotional, and spiritual needs of an individual. Applying any treatment in the late stages of ill health can be extremely costly. Also, due to increasing undesirable aggressive side effects of synthetic medicines, people are now leaning toward natural cure which is believed to not only treat the disease but also eliminate the basic root, treating the body as a whole and not just as a set of symptoms or patterns of disease. Alternative medicine is notable in using time-tested, more holistic natural remedies that are easy to embrace. Many people believe that it offers gentle, hands-on treatments that are simple to use, easily available, safe, and inexpensive. The "Back to Nature" or "New Green Wave" lifestyle has now become a world trend philosophy. In fact, natural plants and herbs have become very important ingredients in traditional therapies and treatment of ailments in the East, where particularly the Indian Ayurveda, the Traditional Chinese Medicine and the Malay "Jamu" and "Makjun" are becoming increasingly popular. In the nature's pharmacy, people are seeking after the grains and grasses of the field, the vegetables and precious herbs of the gardens, the fruits, seeds and nuts of the trees, and of course the sweet honey of the honey bees! Extensive research has been conducted on the recently rediscovered the natural cure and therapeutic benefits of wild natural honey, particularly the Manuka Honey which is noted for its anti-bacterial properties. 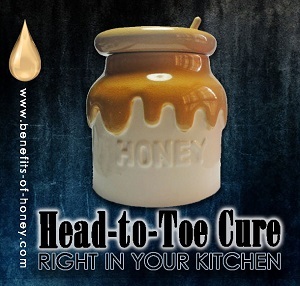 Studies have shown that burn patients who are treated with pure, undiluted, unprocessed honey recovered much faster those treated with conventional burn treatment. A study (1995) by the University of Guelph in Canada which I particularly find amazing shows this: "Burn patients of a variety of ages were divided into two treatment groups. The burns of patients in group 1 were cleaned with a saline solution and were applied honey daily. Burns of group 2 were cleaned and covered with gauze that was soaked in 5% silver sulfadiazine which was changed daily. Results showed that within 7 days 91 % of the infected wounds treated with honey were free from infection, compared to less than 7% of the silver sulfadiazine treated burns. Within 15 days, 87% of honey treated wounds were healed compared to less than 10% of wounds in group 2. Research by Haffejee and Moose (1985) also found that honey treatment shortened the duration of diarrhoea in patients with bacterial gastroenteritis, in that patients treated with honey had a mean recovery of 58 hours compared with 93 hours for control patients. Oh the powers of nature. She knows what we need, and the doctors know nothing. End of "Back to Natural Cure". Back to "Honey as Home Remedy".